Thomas P. Weaver (1841-1922) Click his name to read his autobiography along with this post. Paul Heinegg’s website is frequently used as a genealogical reference but it also contains a collection of invaluable narrative history. 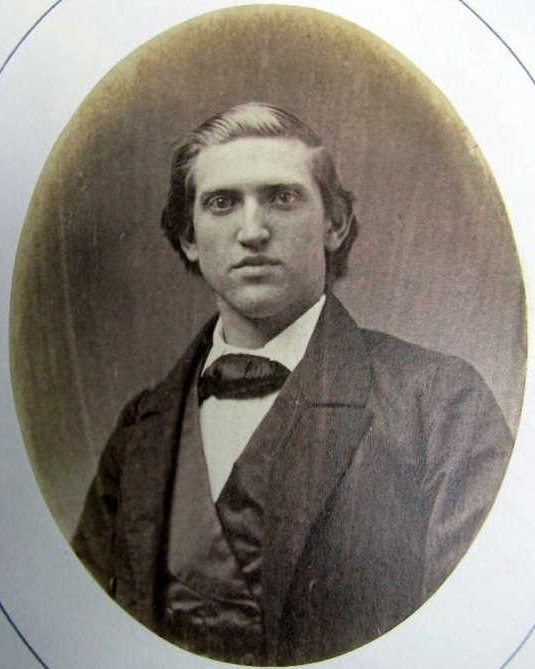 Recently I stumbled upon the autobiography of Thomas P. Weaver, born in Guilford County, NC in 1841. The awe-inspiring account of his life as a pioneer from North Carolina to Indiana covers more than eighty years of American history. While Weaver’s experiences were unique, I was most fascinated by their similarities to those of several of the Basses of Camden County, NC. Weaver provided a human voice to many of the stories I have been piecing together with simple primary sources. 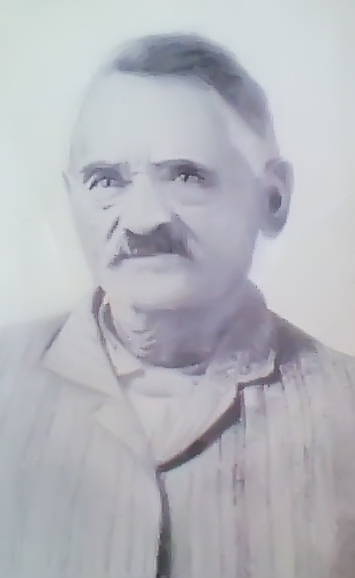 This post will explore the lives of two Camden County, NC women whose children lived pioneer lives much like Weaver’s and I will use his sentiments to reveal how they might have felt as they followed parallel paths. 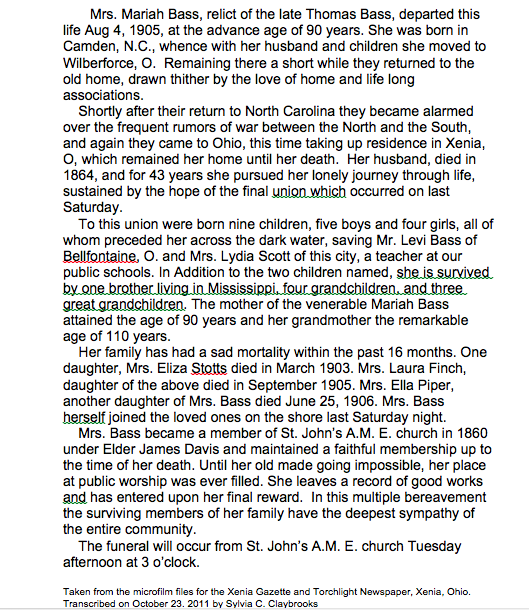 This story will also include direct accounts from the descendants of Bass family pioneers. Lydia and Polly Bass were born in Camden County, NC in 1797. They were the daughters of William Bass and Nancy Sammon and it is possible that they were twins (as their ages were always exactly the same). They were recorded in their parents’ household through 1810 but after the death of their father (some time between 1816 and 1820) they appear to have moved to their brother Thomas’ household (possibly the same location) where they were recorded in 1820. Although Lydia and Polly lived most of their lives undocumented, later records contain information about their youth. Some time around 1820, Lydia met Armor Leary, who appears to have been a slave. It was illegal for free people to marry slaves but it was not uncommon for relationships to form. This left slave fathers as invisible influences on many families. In the early 1820s, Lydia and Armor had two daughters, Lydia (b. 1820) and Alcia (b. 1824). After their daughters they had three sons: John (b. 1827), Willis (b. 1831), and George (b. 1840). Although there is no record of his name, Polly appears to have had a relationship with a slave as well. She had three sons: James (b. 1820), Thomas (b. 1823) and Louis (b. 1824). This is an important part of the story. Lydia and Polly Bass were free women of color (of European, African, and Indian ancestry). In 1820 there were only 117 free people of color in Camden County, NC compared with 4,565 whites and 1,749 slaves (54 of the 117 free people of color were under the age of 14). This meant that when Lydia and Polly were of age, their chances of pairing with an enslaved male were significantly higher than their chances of finding an unrelated, adult, free man of color. This social dynamic continued and may have been part of the reason why Lydia’s daughter, Alcia, and Polly’s son, James, ended up marrying in 1841 despite being first cousins. In 1847 Lydia, still an unmarried female (referred to as a “feme sole” under the laws of coverture) purchased 100 acres of land for $400 from David Pritchard. The parcel was described as lying in the upper part of the county on the south side of Joys Creek bounded by the property of Fanny Edney, Lemuel Edney, Samuel Edney, and Dr. Ferebe. It is unclear how Lydia got the money to buy this land but in the 1850 US Federal Census she was the head of her household with her three sons and her sister Polly living on her land. James (32) and Alcia (26) were living nearby with their children Fanny (7), Armor (5), Oliver (3), and Caleb (0). Polly’s son Thomas (27) and his wife Mariah (32) were living next to James’ family with their children Eliza (12), Levi (4), and Lydia (2). In the neighboring household, another of Polly’s sons, Louis (26), and his wife Mariah (23) were living with their children, Wilson (15), Andrew (13), Cason (11), and Nehemiah (5). The following year, on December 2, 1851, Lydia made a deed of gift for all of her land to her oldest son John. This was Lydia’s last transaction and it appears she passed away shortly thereafter. After receiving his mother’s land, John Bass made a number of transactions—on January 7, 1853 he sold the land his mother gave him for $550 to Elizabeth and Polly McCoy (Deed Book Z, Page 449) and on the same day he bought 27 acres for $700 from Henry Chamberlain (Deed Book Z, Page 440). Two years later, on August 13, 1855, John sold this newly acquired land to his two cousins, Thomas and Louis Bass, for $250. According to family accounts, life became increasingly difficult in Camden County, NC with the impending Civil War. Though Lydia and Polly were free, their relationships with slaves gave their children a duel perspective—they were free but their families were not free. Some time after 1855, John Bass left South Mills in Camden County, NC for Xenia in Greene County, OH where he was recorded in the 1860 US Federal Census in the household of Francis Ritter, an Austrian musician. This was the first common point of migration I noticed between the Weavers and the Basses. Wilberforce in Xenia was a community established on progressive principles. It offered better living conditions and job opportunities that attracted people of color and white abolitionists throughout the south. In 1856, Wilberforce University was founded through a conference of African American religious leaders and state government officials to support the advanced education of people of color. John’s siblings, Polly, and all of her children were recorded in South Mills in the 1860 US Federal Census but several soon joined John in Xenia to escape the rising social and political tension in the South. They did not want to leave and considered returning to be with their family but they ultimately decided that it was safer in the North. Of the original South Mills cohort, Lydia’s children, Alcia and John, relocated to Xenia while Lydia (the younger) and her two youngest children, Willis and George remained. Polly and her two oldest children, James and Thomas, also relocated while her youngest, Louis, remained. Elizabeth Cosby (b. 1865, right) was the daughter of William Cosby (b. 1839) and Frances Bass (b. 1843). Frances (Fanny) was the daughter of James Bass (b. 1820, the son of Polly Bass) and Alcia Bass (b. 1824, the daughter of Lydia Bass). Elizabeth was part of the first generation born in Xenia, OH after leaving Camden, NC. Although Weaver was free from slavery in Ohio, his story reveals that his life was still wrought with struggle. When the Civil War began, he did not hesitate to volunteer. John Bass also joined the military in 1863 as a private in Company A of the 16th Regiment U.S. Colored Infantry. He was a single carpenter at the time and was described as 5’5″ tall with a yellow complexion, black hair and black eyes. John’s brother George, who remained in North Carolina, also enlisted. He was a a private in the 36th U.S. Colored Infantry and was described as 5′, 4″ tall with a brown complexion, black hair and black eyes. There is no record of Thomas Bass having served in the military but he passed away at the age of 41 in 1864. By the 1870s, the Civil War was over and the Reconstruction Era was underway. Polly was a domestic servant for a white woman named Sophia Parry in Xenia. James and Alcia were living with their children nearby as were John and his wife Eliza and Mariah, Thomas’ widow. They each owned a considerable amount of real estate at this time. In Camden County, NC, Louis remained on the Bass family land and owned $1730 in real estate as did his oldest son Wilson. It is unclear whether their money was earned or the result of an missing inheritance. James and Alcia, the children of Polly and Lydia Bass, ended their pioneer journey in Arlington in Van Buren, Michigan 900 miles away from where they were born. They left a number of essential records that shed light on their journey, including the 1900 US Federal Census which recorded that they were married in 1841. Their 61 year marriage and migration through four states covered several important locations and moments in American history. 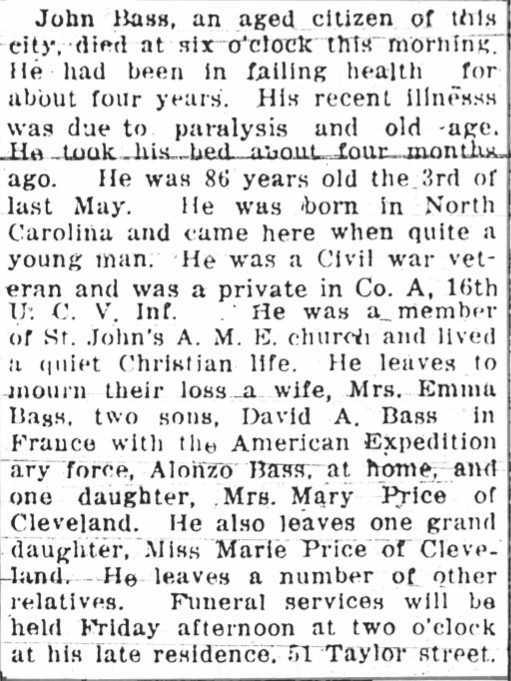 The 1948 obituary of James and Alcia’s son, James Franklin Bass, provides a testament as to why their family left Camden County, NC in the 1860s. It reads, “Bass was born in Zenia, O., the son of James and Alcia Bass. His parents, born in slavery in North Carolina, had made their escape through the underground railroad to Ohio.” Although it is historical fact that neither James nor Alcia was born into slavery, their fathers were enslaved and this statement reveals how they felt living in the South. There is much more to discover about the lives of the pioneer Basses and their relatives who remained in South Mills through the 1900s but one thing is clear—regardless of being born free, people of color lived through grave dangers. Their freedom could have been stolen at any time and countless families moved from place to place to avoid the threat of being enslaved. These shared experience formed many communities of white abolitionists, African Americans, and people of mixed race who banded together to survive.